Globe SP80PL Planetary Floor Mixer, 80 qt. Home / Food Prep / Commercial Mixers / Stand Mixers / Globe SP80PL Planetary Floor Mixer, 80 qt. The perfect mix of value, performance and durability! The heavy-duty gear driven transmissions easily mix all kinds of products, and front-facing controls allow you to track your batch from across the kitchen. 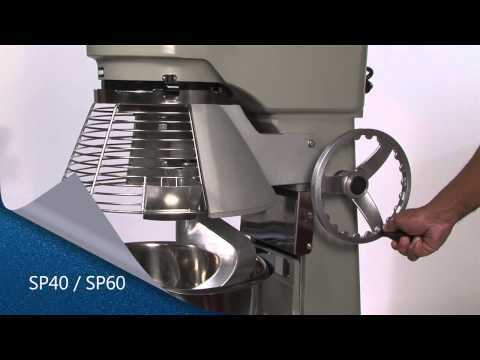 Globe's SP80PL is made to hold up to 80 quarts per mixing batch. This mixer features front mounted controls, 4 speeds and a 60 minute timer for accuracy and easy control. This product measures at 62 inches high by 30.25 inches wide by 38.6 inches deep. Power bowl lift, NSF, cETLus, 12 Amps, 3 HP, 208v/60/3, hardwired.